So it’s been awhile since I’ve been here… I mean, I hate to bore anyone with the mundane-facebook-like-updates of “Had great toast for breakfast” or “Don’t you hate it when your tire is flat?” I like to wait until I have a breakthrough idea or brag about something fabulous I have found. Well, the latter has happened. For Christmas, I had a friend who indulged the comic- geek-girl in me. He took the time to research one of those “Best of” lists for 2012 and came across a graphic novel that sounded interesting. He even double-checked with the guy at the counter of the comic book store who gushed over the validity of the book’s status on the “Best of” list. So today, with a little time to myself, I decided to pull it off the GIANT pile of unread books and give it a whirl. Now, if you know me you know two things (1) A rarely take the time to read. It makes me tired, it takes me too long and I have so many books that the thought of starting just one is overwhelming and (2) At any given time, I might have 3-4 books started that don’t get finished. I don’t know what my hang up is? I REALLY like to read, I just … anyway, back to the task at hand. 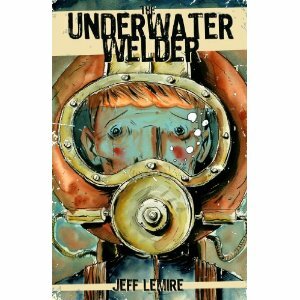 THE UNDERWATER WELDER by Jeff Lamier is like nothing I’ve never read before. It lives up to the hype for sure, of being somewhat like a Twilight Zone episode on paper. In quick fashion you really are involved with Jack Joseph and his very real story of tragic accident in his childhood invading his adulthood and the life he’s trying to keep with his wife and unborn child. And as you go deeper and deeper with Jack, you continue to wonder … is it real? Is it a dream? Is he going crazy? Until the last page or two, you don’t know. But, because it is so well written, you are happy to go on this wild journey with him just to see where it goes!